Our unique approach and emphasis on individual development sets CFA apart. Our player centric development plan ensures optimal education for each player based on their specific needs and talents. The approach is systematic, age specific and individual. We develop strong personalities with optimal techniques under pressure, high tactical skills, fitness and determination. CFA's program is derived from the successful Talent Development Program of the German Soccer Association DFB, which kindly supported CFA's program set up. In addition to developing individual player technique and tactics, CFA also focuses on flexibility, coordination and speed – all fundamental for elite soccer players. Regular running technique training and fitness programs are included as part of the program for Academy players. At CFA, we focus on individual development by conducting a thorough skills and personality assessment upon entry into the Academy. 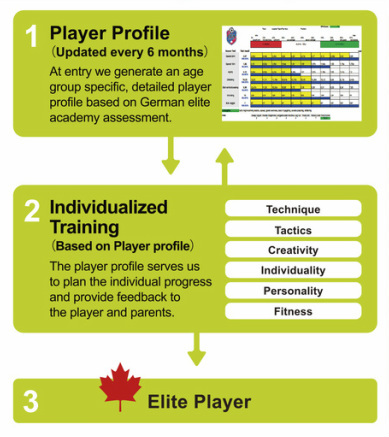 Individual player profiles are conducted and maintained so individualized programs and training can be facilitated by our high-performance coaching staff. Continuous feedback is provided so players, and parents, can see the progress and areas for future improvement. The Senior Profiles of our players are identical to the performance profiles used by the Bundesliga Academy players and the Junior profiles are developed by CFA. Establish a world class soccer education program with outstanding quality players. ​We strive to provide the optimal environment for our players to become confident, exceptional soccer athletes with strong personalities, who also excel in their academic education.